How much is general admission ? General Admission is the non-discounted Front Gate admission price (the price for guests ages 12-61). General admission is $58 for the 2019 season. At what age do children need a ticket? Kids age 2 and under are free! Ages 3-11 require a ticket. Are the rides included with admission? Yes! Your admission to the park includes all rides, shows, and attractions. 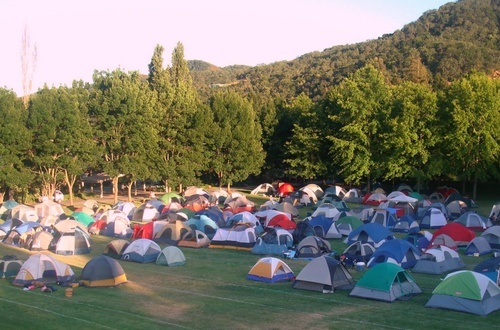 Fees for parking, food, merchandise, food, and pay-per-play experience attractions, concerts, and special events are not included. Is there a non-rider admission ticket available? Gilroy Gardens does not offer a non-rider discount. 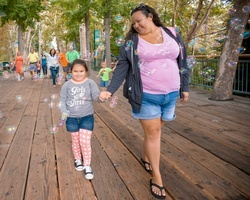 Gilroy Gardens Family Theme Park has a one-price admission as it is a multi-faceted park, not just a ride park. The park also offers a variety of attractions, gardens, gift shops, restaurants and much more. What if I experience an issue printing my online tickets? No need to panic. You can have your tickets printed for you at Will Call/Guest Services at the Front Gate. You will need your I.D., the credit card you used to purchase the e-ticket, and your order confirmation number. As a special thank you to our military, we offer a special Military Any Day Discount. Military personnel (active) and guests may purchase a $30 General Admission (day-time) at the Front Gate on ALL public operating days during the regular season, good for up to six (6) people. Tickets are valid on date of distribution only. Discounted tickets may also be purchased at many California Military Bases; so check with your local military base. Is re-entry allowed at the park? Convenient exit and re-entry is available throughout the day of your visit by the hand-stamp provided at Stroller Rentals near the exit of the theme park. 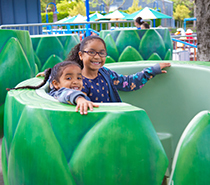 Admission tickets and Memberships are non-refundable and non-exchangeable for any reason after the order transaction is complete at the Front Gate, online through our website, by phone or when purchased at Costco or AAA. This includes weather related events. We do not issue rain checks. Please check local weather conditions prior to planning your visit. May I bring in food into the park? Single and double-seat strollers, manual wheelchairs and battery-powered wheelchairs are available near the park entrance. Rentals are on a first-come, first-served basis and cannot be placed on reserve in advance. Quantities are limited. Pricing is $12 for a single stroller, $18 for a double stroller, $15 for a standard wheelchair, $45 for an electronic wheelchair and $50 for an electric wheelchair with a canopy. Lockers are available for rent in two locations: behind the Sugar Plum restaurant, and at Water Oasis. Don't let a few clouds, or even rain, keep you away! 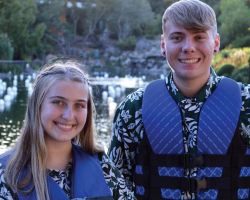 Days with inclement weather can be the best time to visit Gilroy Gardens because lines are short and fewer guests may be in the Park. The Park is open rain or shine and usually with almost all rides operating. It's fun to visit all year long, but if you're looking for a quieter time to head out to the park; weekdays during the summer, and weekends in the Fall may be just what you're looking for. Guests arriving at the park may be subject to metal detection. All bags, purses, backpacks, waist packs, etc. may be subject to a brief examination prior to entering. Gilroy Gardens does not tolerate guests who fight and/or harass other guests while on our property. People who engage in this behavior are subject to being ejected and potentially banned from the park, and may be subject to arrest by local police. Outside food or beverages, large or soft coolers, glass containers, sharp objects (including pocket knives and metal chains), firearms, or other items that could be considered a weapon are strictly prohibited. We encourage guests to leave any unnecessary items at home or secured in your vehicle. Exceptions are made for guests with special dietary needs to include food allergies and baby food/formula. Guests should contact Guest Services or Park Security upon arrival for approval to bring in these special dietary foods. Are animals allowed at the park? Only animals that the American's with Disabilities Act (ADA) defines as Service Animals are allowed in the park. A service animal is defined as a dog or miniature pony that has been individually trained to do work or perform tasks for a person with disabilities. We may ask you what task your service animal performs for you. There is a limit of one service animal per guest. Service animals must be physically controlled on a leash or harness at all times while on our property. Due to the nature of most rides, service animals must remain with a non-riding member of your party. We are not permitted to take control of your service animal. Guests whose service animal demonstrates aggressive actions towards other guests or employees will be directed to remove the animal from the park. For your convenience, a relief area is located behind the Apple & Worm ride. Please stop by the Welcome Center for more information. Do you have kennel facilities? Gilroy Gardens has a very limited kennel facility. We encourage guests to leave their pets at home whenever possible. Special considerations are made for licensed sight, hearing and companion guide dogs (i.e. Service Animals), all of which are allowed to enter the Park. 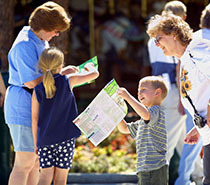 For your convenience Gilroy Gardens accepts cash, travelers' checks, Visa, MasterCard, American Express, and Discover card in most locations. Most payment types require additional identification. An ATM is available inside the park at our Welcome Center and at the Front Gate near Will Call. Personal checks are not accepted in park. For the convenience of all of our guests, smoking of any kind, including vapor and e-cigarettes, is not allowed past the park's entrance turnstiles.